Christianity, Hope, and Art- An Interview with Lisa Guinther | J.W. Wartick -"Always Have a Reason"
Recently, I had the opportunity to talk to Lisa Guinther. Lisa is a late-in-life college student who has been accepted as a philosophy major (undergraduate) at CU Boulder (2014 expected graduation) She had been a student at Colorado Christian (College of Adult Studies) since 2009 with an undergraduate Certificate in Biblical Studies. She is the owner/designer of Woman of Wisdom Creations and is an illustrator who was published in a national Christian magazine, and is illustrating a children’s book scheduled to be in book stores summer 2013. J.W. : Describe for me your journey as an artist. Lisa: I started being involved in art in high school. I was a freshman in an art department and surrounded by art majors. I was surrounded by people starting to experiment in art. I learned from some sessions and took some classes. So I’ve always fiddled around with art, a lot of classes in oil painting, water colors, and acrylics. It never really was encouraged, but I never let it go. I never considered how my art could affect my Christian walk until recently. I was apostate for almost 12 years. Within a year or two of my “coming back”, so to speak, I went to the Denver Museum of Art. They had a featured handwritten Bibles and they just caught my attention and wouldn’t let me turn away. They were pre-Gutenberg press, handwritten Bibles, and the care that it took to write out and draw out the words and frame each passage clicked with me. I began thinking what if I could make the Bible art? That was when I started Illuminated Texts [Lisa’s Blog]. I was making presents… eventually I was done with that and decided to express Bible verses in a painting. J.W. : How has your Christian worldview influenced your art? Lisa: Something I noticed with art in the Christian tradition: I find when I visit the Lutheran churches that they still have a tradition of promoting art. But in a lot of other evangelical-type churches, there is little promotion of art. There’s not a lot of art. It’s gotten really short shrift. An artist friend who used to be involved in the Abstract-Expressionism movement explained to me that the whole ideology of abstract impressionism is actually idol making. About the time of impressionism, which started with Monet, at that point people thought art was dead. Paintings were seen as a framed window. But with the camera, artists had to see art in a different way. They began to put themselves onto canvas and put themselves on the wall. Artists kept trying to outdo each other—this is a truncated explanation—but it became creating idols. It became the artist’s impression of nature, and then it became the artist emotional expression. If you’re creating art that’s just that—the inner expression of a moment—then you can put anything on a canvas. Now is that really art? I don’t know! What is the nature of art? Nicholas Wolterstorff gave a lecture on this topic—is art an intrinsic good or an instrumental good? It may be both, I don’t know. Is there a part of this that we could get possibly back to a definition of art as representing God’s creation and the beauty within that creation that’s there because beauty is a part of God’s nature? …[T]here is just so much gratuitous beauty in the created world. I think that’s one way to do natural theology, a way to point to God. Is there a way to get back to a representation of beauty in art that would point us back to God? We can be authentically Christian and authentically artists. You have to engage… [some kinds of] art to begin to see its beauty. The Bible is kind of like that. You can surface read it and you learn things and this is good, but you don’t really get the deep level of beauty in Scripture until you really dig in and study it. At times when I’m painting or drawing, it’s almost as though I’m praying. There is a mystical aspect—I feel like there are times when I’m thinking about prayers or meditating on Scripture or just thinking about God as I’m painting or drawing and I know these are God’s gifts that He gives me, but I feel like in some tangible way I’m showing what I feel. It’s a tangible way to express other than in writing—it’s the way abstract impressionism should be. I think we need a better working definition of art. A paperclip… might be under the definition of instrumental art, but we need to bring back representational art but we can also see abstract art that can draw us into a deeper understanding just like the way we read Scripture. J.W. : What are some ways for the Church to promote art and artists? Lisa: Look at the history of art in the church. You needed people for stained glass, for alter decorations, and there was a whole system in place that would support artists. But we haven’t been doing that since the Reformation. People don’t understand what a painting costs. A 30×40 canvas is 100$, along with the palette of colors, and the other costs—tubes of paint as 4-12$—and I have a full palette of colors. It’s expensive. J.W. : How could the church support artists more effectively, in light of that? Lisa: In a larger church, there could be an art show. Some churches do this every quarter or even every month. You generally find that within every church there are artists. They’re there. You just need to put up a sign up sheet and people will come out of the wordworks. Remind parents that if you really want to stimulate imagination—the same skills you need in math are important in art and music—to promote kids to do artwork is to promote their reading skills, creativity, and math skills. We want creative expression in how we worship. Worship is creativity and if you’re worshiping you generally have some spark in you of artistic talent. If we could encourage art as a form of worship, we can’t lose that. Within Roman Catholicism there always was a theology of beauty as an attribute of God. J.W. 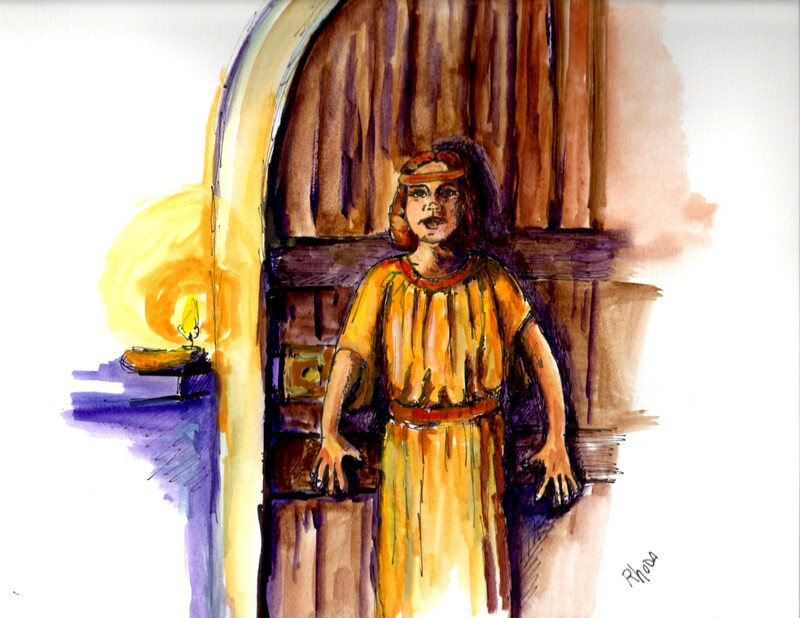 : What can you tell us about the “Bold Girls of the Bible” and your illustrations? Lisa: One of the points I’d like to make is that I’ve tried to keep the illustrations as real as possible. I think it is important that we not present Biblical stories in some kind of airbrushed, phony way. I’ve always been a history buff. I’d like to present these characters in a way that people see them as real—the kids can see them as real. I don’t think that beautiful pristine white robes is historically accurate. Can I present characters that illustrate the stories in as real way as possible so that kids can relate? Can I make it real for the kids reading it so they can relate to the people? When I was growing up I saw the Bible as something not really real. Can I, in artwork, make it real for us? And that’s what my friend Mary [the author of Bold Girls of the Bible] tries to do in her writing. Can we make the characters in the Bible real enough that little girls can relate to them? Everyone knows about David and Goliath, but I never had a Bible hero. J.W. : How are you composing the art? Lisa: I pose kids, take a photograph, print out the picture, and do an outline sketch. Then I put the backers on it, drape the clothing, create the character, and create the image from the sketch. J.W. : Do you have a Bible hero now? Lisa: Hands down, St. Paul. I often try though, if I had to pick a character that I could write a story around or draw a picture of, I wonder a lot about Deborah and what she had to go through. J.W. : You mentioned natural theology, how would you look to integrate your art with apologetics? Lisa: We all have a sense of beauty in art and in nature and in music even though it may be amorphous. Everyone has a universal sense called “beauty” and the only way there can be a [Platonic] universal is if there is a creator. It’s why we have the idea of good, beauty, truth. I agree with the idea that we know good because God is the exemplar of that. We know beauty because it is a part of God’s very nature. I think we know beauty and we can see it in the world around us because we are created in the image of God. We also want to, in our own way, create. That creative spark within us is really a part of the image of God in man. My thanks to Lisa for this wonderful interview. I think we both had a lot of fun talking about God, apologetics, and art. You can view some of Lisa’s art at Illuminated Text…. by Lisa. Lisa has her own apologetics site, Insights from the Furnace, which integrates the arts with apologetics. Thanks for this interview…it’s beautiful to see how the Christian worldview and our faith fuel art! I agree. Art is such an integral part of the Christian experience.